Kenzi is better with open steps than Keno. he would rather forge the creek than cross the bridge. I sometimes have to pick him up and chuck him on the bridge because he just tries to skate around the steps to the bridge. Does he then do the pancake? Ami did the pancake maneuver at the vet's on Fri and she said..."Yup, typical for the breed!" No, no pancakes. But then the leash that I use pretty much ends that. He can't do the whole dead weight thing when the lead starts to tighten down on his chest. He usually tries to race to the other side as fast as he can. Thanks! I got it off ebay. It is an outward hound pack. Had it going on 3 years now and still in great shape. It's held up well for me. do you use it in place of a regular harness? What a great accessory! I do not. There isn't really a good sturdy spot to attach a leash to this unit aside from the pack handle. I have a weiss walkie leash that I use that slips over and in front of the pack's harness. You can kinda see how the leash works in this picture. It wraps under her belly just behind her front legs. I put the pack on and then this goes on over the harness system for the pack. It works on a pressure system, so the harder she pulls the tighter it gets so there isn't any slipping this like she could some harnesses. 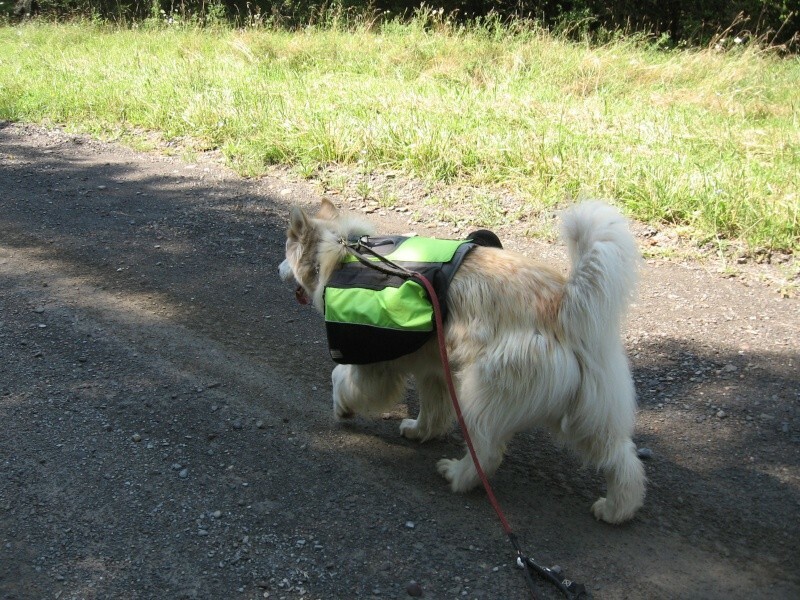 Ruffwear has a pack called the Approach pack that is a backpack/harness that you can attach a leash to as a harness but I don't know if the saddle bags are detachable to be removed if the dog gets too tired or it gets too hot while hiking. Found a better picture of how the leash works. You can see the clip that attaches to her regular collar in this photo. Awesome! I definitely want Lutsen to start getting used to wearing a harness instead of just standard leash and collar. She looks super comfortable! Jenn I love those two pics!!! First one is just beautiful! kohdi mishka kenzi and ami are all so fluffy! We saw a husky pup roughly same age as Lutsen on our walk this weekend and he was a ball of fluff like ami! So cute...Lutsen's coat isn't as puffy but that's what i love about the breed there's so much difference within every dog its so cool. i guess i could have said long instead of puffy but hopefully you guys get what i mean lol! I have upgraded my camera and that helped with the later pictures. What I can't figure out is why half of the pictures in my scrapbook are gone. Not sure if it's this browser or what. The file location for all the pictures hasn't changed so they should still show up, but I don't see any of the Arkansas trip and half of my earlier pictures pre-Keno aren't showing up either. Jenn, others have mentioned that too, I wonder why that happens. I love the first pic of Kenzi on the rock, she looks so good. Are you using serve image? Most of my scrapbook is now missing. No, they are hosted on facebook. I have them in private folders on facebook but they have always been setup that way and worked fine before. Only thing I can figure is that facebook adjusted some formatting somewhere and it screwed some stuff up, though I would have expected all of them to be screwed up prior to the date the changes were made and that isn't the case. I use Serve image too. All of Miya's pics are there. I am wondering if it has to do with how long from post to post. As in over 2 months since last post pics disappear. The last time I posted pics in Miya's scrapbook, it has a little message that says less than 2 months......>2months(I may not have the right arrow direction), and had wondered what that meant. I wonder what Jimmy uses and if all of his pics are there since his scrapbooks are much larger than ours? There must be a reason for this, but instead of FB Jenn I think it has to do with this site. I remember a few other members here mentioning the same thing. also Jimmy and myself post pics much more frequently than you(Jenn) and Amy, so that is why I am wondering if it's the frequency of posts, vs the image server used. It's a bit strange. My pictures from nearly 3 years ago when I first got kenzi still show up on the site, but my pictures from 6 months ago when we went hiking are gone. I know that this site did change something, the less than 2 months thing never showed, and then maybe 6 months ago maybe less it appeared. Otherwise my theory is out, haha. ''Allowed formats : bmp, jpg, png, gif, tif < 2 Mo"....< 2 Mo this part was never in that message and like I said less than 6 months ago it did. I use this sites servimg. I've noticed my pics come and go, there have been times a pic or two have been missing from a sequence of pics I've posted,but were back the next time I happened to look. I'm only speculating but I do think when there's lots of pics missing, that maybe it's because the scrapbook has been inactive. I've also noticed that in threads like "funny pics" where people have posted funny pics of huskies, many pics aren't hosted anymore, so I'm not sure if they used a different server to upload their pics or what but same thing happens in those threads where some pics have stayed and others aren't visible anymore. Mine disappeared from serve image, too. Today marks three years I've had Kenzi. She got a cake I put together last night. This day always sneaks up on me so I forget to pick up stuff to make her a really fun cake. She gobbled it down none the less. Can't believe it's been three years. She seems to have settled in well. Don't think she wants to leave us anytime soon. The most excited face she has ever made over food. And some shots of Keno. He's still around and has hair on his chest once again. He also has quite the markings when he's been out in the rain. Happy gotcha day, Kenzi! That cake looks good so I don't blame her for wanting to gobble it down!